Nice work; I seem to get no sound despite enabling the ALSA drivers (although this is not a surprise) and it’s a little too slow to be playable, but it’s certainly a starting point! Agreed… the 2D graphics performance is quite poor, hopefully this will improve with newer releases. The sound, however, is at least now functional in the newer builds, 2012-06-18-wheezy-beta.zip and more recent. I kept getting error messages for the downloading, same with apt-get update. Just a problem with my network (internet seems fine otherwise) or a broken link down the line? I was having some issues with apt-get yesterday. Took a trouble tries to update. Working fine now. I’ve had intermittent issues with the apt sources recently as well… glad to hear you got it working! You find a demo video at the end of the post. Nice work Florian! The gameplay for the SNES in your video is much smoother than I have been able achieve so far on the NES. 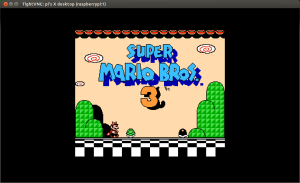 I was not previously familiar with RetroArch project, but it certainly looks very promising as multi-emulator frontend for the Raspberry Pi! Ok, then the line that has “svn checkout https://fceultra.svn.sourceforge.net/svnroot/fceultra/fceu fceultra” should be replaced by what? Maybe “svn checkout svn://svn.code.sf.net/p/fceultra/code/fceu fceultra” or no? That’s right. I have updated the post accordingly! Thanks for pointing out the new repo address domedan! Package libsdl1.2debian-esd is not available, but is referred to by another package. as the libsdl1.2debian-esd is not available I installed the libsdl1.2debian. 3) It takes a while to compile, so you might want to find something else to do for 15 minutes or so. 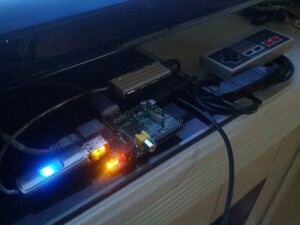 4) My pi is connected to a composite tv. The display is not working very well at all. Seem I can only see game screen when I hit pause. Any suggestions on tweaks in FCEU settings or Raspbian? Got mine working after I tried your method, else it will stuck there forever, thanks. Actually Michael missed a step. After you CD to “fceultra” folder, you still need to CD one more time into “trunk” folder. You should be in “~/fceultra/trunk” after you finished that step. You can now issue the command “sudo scons GTK=1 install”. I bet you will continue to face several problems before successfully installing the program (because I had experienced it).